A Wild Safari Prehistoric World Feathered T. rex dinosaur model. A beautiful model of a feathered Tyrannosaurus rex. A wonderful, hand-painted model of the fearsome predator Postosuchus. A huge meat-eating reptile that ate dinosaurs.Great for imaginative, creative play, part of the Wild Safari Carnegie Dinosaur Collection. A Wild Safari Prehistoric World Giganotosaurus dinosaur model. A fantastic Giganotosaurus dinosaur model. A Wild Safari Prehistoric World Feathered Velociraptor dinosaur model. A beautiful model of a feathered Velociraptor. A Wild Safari Prehistoric World Ankylosaurus dinosaur model. A fantastic model of an armoured dinosaur. 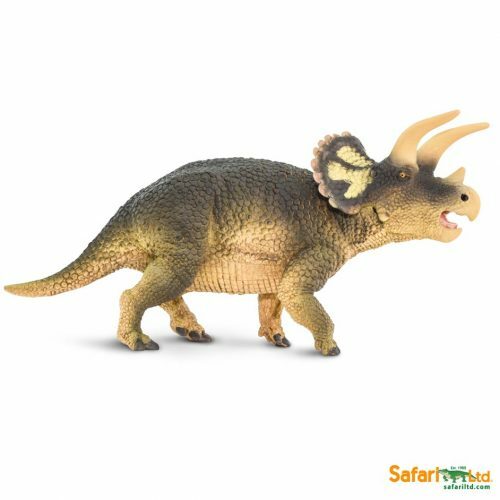 A Wild Safari Prehistoric World Triceratops model. An amazing model of the famous horned dinosaur Triceratops. A Wild Safari Prehistoric World Anzu wyliei dinosaur model. A fantastic model of the bizarre Anzu wyliei dinosaur.